Currently, there are more than 58 million Americans affected by the skin condition known as actinic keratosis. This common skin cancer precursor is characterized by crusty or scaly lesions, which are caused by the sun’s damaging ultraviolet rays. Doctors often refer to this skin disorder as solar keratosis. Actinic keratosis (commonly referred to as AK) are crusty or scaly growths, commonly found on the face, ears, lips, bald scalp, neck, forearms, backs of the hands, shoulders, and other areas of sun-exposed skin. Initially, actinic keratosis lesions are so small that they are frequently detected by feel as opposed to sight. If you run a finger over an AK skin lesion, it will have the consistency of sandpaper. Generally, there are more invisible AKs than visible ones on the surface of the skin. Developing slowly, actinic keratosis will reach from one eighth to one quarter of an inch in size. In the early stages, solar keratosis can go away and come back at a later time. The majority of the skin lesions are red in appearance, while others can be pink, light to dark tan, or even skin colored. Some of these growths may be itchy, tender, and inflamed. Rarely does an actinic keratosis actually bleed. Actinic keratosis skin lesions indicate that you have sustained sun damage, which could lead to any form of skin cancer. The majority of actinic keratosis skin growths are caused by chronic sun exposure. Since sun damage is a cumulative thing, very short times in direct sunlight will add up over your lifetime. Even on cloudy days 70% to 80% of harmful ultraviolet (UV) rays filter through the cloud cover. Damaging rays can bounce off water, sand, snow, or other reflective surfaces, which add additional sun exposure. UV radiation from sun lamps or tanning beds can be more harmful than sunlight. Actinic keratosis skin lesions caused by overexposure to industrial chemicals or X-rays are rare. Since sun damage is cumulative, older people are much more likely to get actinic keratosis, including people over 50 years of age. Some medical experts think the vast majority of people over the age of 80 years have some degree of actinic keratosis. That being said, some individuals in their early 20s can also be at risk. Patients whose immune systems are compromised by AIDS, chemotherapy, or organ transplants all have less defense to ward off the effects of UV radiation. So, they are also at an increased risk for actinic keratosis. People with fair complexions and light colored eyes are at risk for developing AKs. This includes grey, green, amber, or blue eyes. Additionally, people with red or blond hair have a greater chance of getting this common type of pre-cancerous skin lesion. Men are slightly more prone to actinic keratosis, because they spend more time in the sun and tend not to use as much or any sun protection as compared to women. Even though actinic keratosis is the most common skin cancer precursor, not all instances will progress to cancer. However, there is no reliable way of knowing which skin lesions will or will not become skin cancer. Examine your skin from head to toe on a regular basis. Always consult a dermatologist immediately if you notice any abnormal looking skin lesions, changing growths, or scaly, red areas. Bald scalps on males often reveal chronic sun damage. 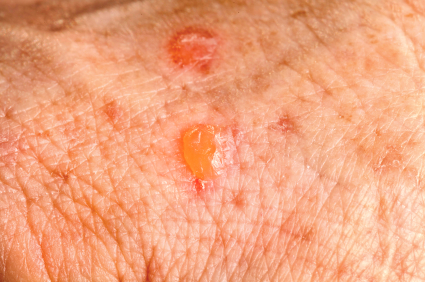 Growths will appear elevated, have a rough texture, and often look like common ordinary warts. The rims of the ears are typical spots for crusty, rough solar keratosis to form. Blood-filled, horn-shaped scales on cracked lower lips may be covering large-sized solar keratosis lesions. Avoid tanning lamps and sun beds. Stay in shady spots, particularly between 10 AM and 4 PM. Liberally apply sunscreen to your body ½ hour prior to going outside. Apply sunscreen every 2 hours and right after excessive sweating and swimming. Wear long loose clothing, a wide brimmed hat, and UV protective sunglasses. Keep newborns in the shade, as sunscreen is off limits for infants six months or younger. Examine your skin thoroughly every month. Get a professional skin exam every year.